Lockerby Composite School invites Grades 8 students and their parents/guardians to an Information Night on Thursday, December 6, 2018 at 7 pm. All students are welcome to participate, regardless of which elementary school they currently attend. Participants will be able to speak with current students, staff and parents/guardians about programs, including the Science Technology Education Program (STEP). Busing to Rainbow District School Board’s specialized secondary school programs is offered to students within Greater Sudbury. The Science Technology Education Program (STEP) enjoys a rich tradition at Lockerby Composite School. STEP is recognized as one of the most innovative secondary school programs in Ontario. With a focus on math, science and technology, the program is for students contemplating a career in medicine, science, health care, business, computer science, design or engineering. STEP students are actively engaged in their learning by keeping pace with the latest trends in science and technology through involvement in initiatives such as anywhere, anytime laptop learning, the AP Capstone program, the provincially recognized Specialist High Skills Major in mining and health and wellness, as well as courses in architecture, interior design, engineering physics, medical biology, medical technology and environmental chemistry. Lockerby Composite School also offers Specialist High Skills Majors (SHSM) in Information, Communication and Technology (ICT), Mining, and Health and Wellness. SHSMs are specialized, Ministry of Education approved programs that allow students to focus their learning on a specific economic sector while meeting the requirements of the Ontario Secondary School Diploma (OSSD). SHSMs assist students in their transition from secondary school to apprenticeship training, college, university or the workplace. Lockerby Composite School is located at 1391 Ramsey View Court in Sudbury. Lockerby Composite School will host an information night for Grade 8 students and their parents/guardians on Thursday, December 6, 2018 at 7 pm. All students are welcome, regardless of which elementary school they currently attend. 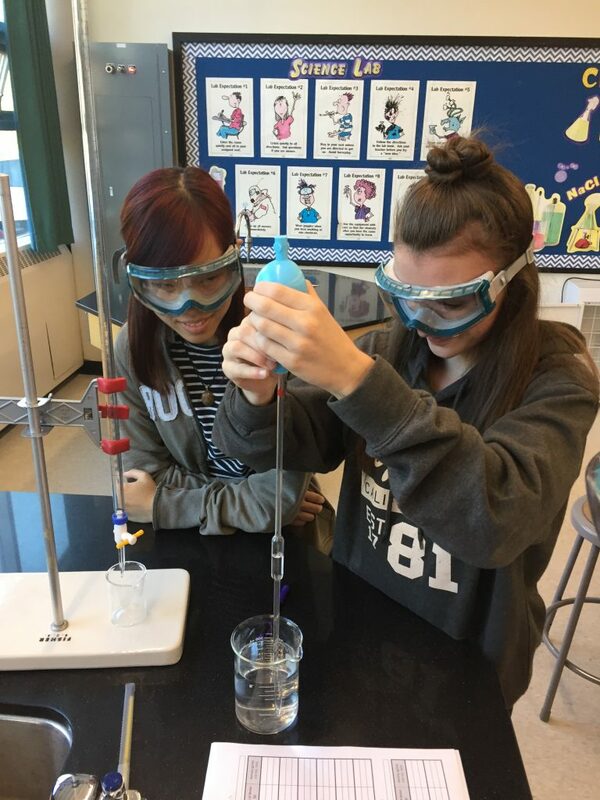 Summer Chan, left, and Sara Perfetto refine their laboratory skills in the Science Technology Education Program (STEP).